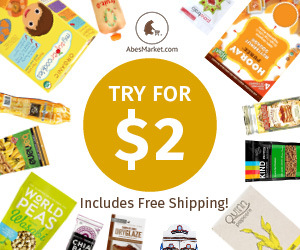 Cheap Mama Chick: Try Natural and Organic Items for Just $2 and Shipping is Included! Try Natural and Organic Items for Just $2 and Shipping is Included! Abe's Market cracks open cases of natural and organic products daily so you can try individual products and see if you like them before committing to a full case. Choose up to three new products per day (baby food, supplements, body products and so much more). Each is only $2 and shipping is included! I've tried some really awesome items so far and new items appear at 11am EST daily! See today's here (in the "TRY for $2" section)! 20% Off Tea Collection’s Newborn Styles!